The brilliant movie ‘Stagecoach’, made in 1939, is often referred to as the “start” of John Wayne’s stellar movie career. It is certainly the movie that got h im noticed and propelled him to Hollywood stardom as the Ringo Kid, but the movie actually marked the end of a phase of his movie career – the period from the late 1920’s to 1939 – when Wayne, the big ex-football player was learning his new trade. During this time Wayne appeared in many ‘B’ Western movies such as ‘Range Feud ‘ in 1931, ‘The Man from Utah ‘ in 1934 and ‘The Oregon Trail ‘ in 1936 and he made valuable friendships with people like John Ford and Ward Bond which would stand him in good stead throughout his career. If ‘Stagecoach’ had come along at the star, not the end of the 1930’s, then Wayne would not have been ready for the challenge. The movie is generally regarded as the first great Western film and is full of top notch, Oscar-calibre performances from such quality actors as Thomas Mitchell,, Claire Trevor and John Carradine, and even so, the young Wayne alonst steals the show. He went on to star in most of ford’s subsequent major Westerns, as well as war films and dramas and his career was made. 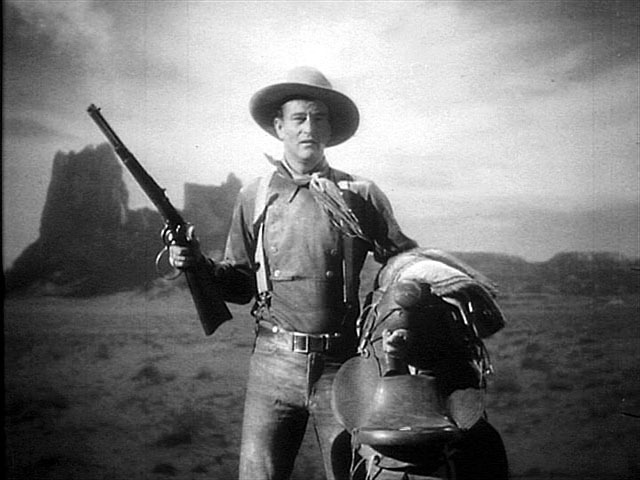 This entry was posted in 1930's, Actors and tagged actor, john_ford, john_wayne, ringo_kid, stagecoach, wayne_movies. Bookmark the permalink.